Based at the Pier Garage in the island's capital Portree, the firm started in the 1920s when Neil Beaton returned home from the Great War. A hackney carriage licence was obtained in 1921 and a mail contract from Portree to Sligachan was obtained in 1923. 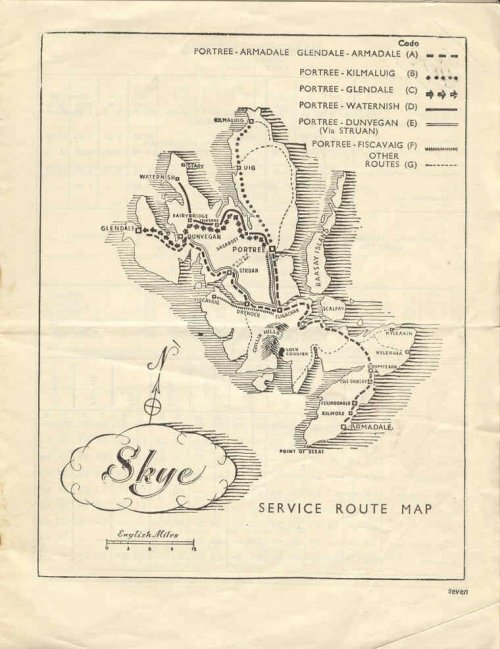 July 1928 was advertised as the start date for a bus route from Kilmuir via Uig and Portree to Kyleakin, serving Armadale as an alternative destination on Thursday and Saturday. A 14-seater Morris Commercial bus ST5152 had been obtained the month before. 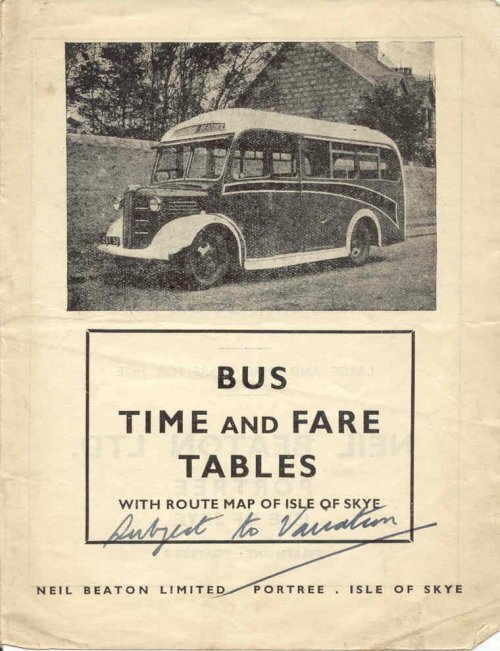 Until after the second world war 14 seats was the maximum size bus allowed by law on the Isle of Skye. As well as summer excursions by coach, cars were available for hire, and their garage was the agent for Skye for Morris, MG, Riley and Wolseley cars (which facts were prominently portrayed in a full page advertisement in their bus timetable booklet). They also advertised their services as electrical engineers. No less than twelve new Austin buses were acquired between 1943 and 1949, with seating capacities ranging from 14 to 21. 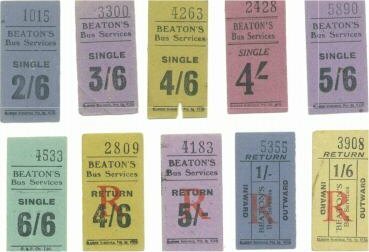 Approaches were made by David Macbrayne in both 1949 and 1951 with a view to acquiring part or all of Beaton's bus business but they did not come to a conclusion. In summer 1952 a weekly express coach service was introduced between Portree and Glasgow, called 'The Islesman'. There had been considerable objection to this route from British Railways, SMT in Edinburgh and Macbrayne's. Hugh Macrae was Beaton's manager at the time. Skye Cars (A. Sutherland of Broadford) took over and ran the service from May 1953. The journey went south on Friday and returned north on Saturday, ran during the summer months from May September only and the fare was one pound five shillings single. Neil Beaton, the founder, died in January 1945 aged sixty. The limited company was formed in 1946. In December 1952 the Clarion of Skye reported that the business had been bought by Andrew MacLaren and Peter Macleod, former employees of the company. Soon after that the decision was made to concentrate on the motor car side of their business from their garage in Dunvegan Road, Portree, perhaps partially because of the poor state of the island roads and the consequent daily punishment their buses received, as well as falling viability. The various bus routes were put up for sale, with 'Commercial Motor' of 12th December 1952 reporting three routes offered for sale. So Beaton's progressively withdrew their network of green and cream liveried buses from the roads of the island. In March 1953 the Portree - Uig - Kilmuir - Kilmaluag service passed to Alexander Macleod of Duntulm at the same time as Ewen Macrae of Carbost, the operator of the Glenbrittle to Portree route - 'one of the most difficult routes in Britain, and the most beautiful' said the Clarion - acquired the Fiscavaig / Portnalong to Portree route from Beaton's. The Portree - Sligachan - Struan - Dunvegan service was also withdrawn about this time, sold to Murdo and Alexander Macphie of Shagarry in April 1953. There was always considerable duplication of mileage on those two routes. At the same time the Portree - Edinbane - Dunvegan - Glendale route (and connection to Waternish) went to Alexander Nicolson of Skeabost Bridge. Subsequently it passed to Peter Carson of Dunvegan in 1965, who in turn sold the route to Macbraynes in 1970. This left only the long but important routes from Portree via Sligachan and Broadford to Armadale Pier route, and the associated route from Glendale and Dunvegan to Armadale. These routes connected with the ferry from Armadale to Mallaig, the terminus of the rail line to Fort William and Glasgow. The accompanying notice of cessation appeared in the August and September 1953 issues of the Clarion of Skye. 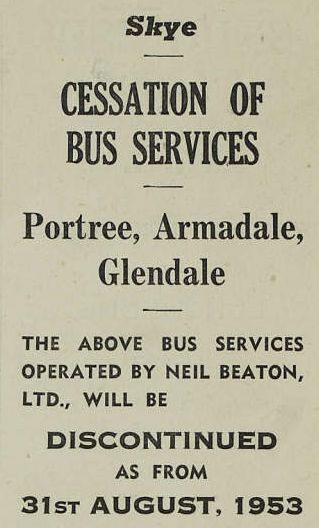 Having survived for a final summer season with Beaton's the Portree route went to Macbraynes (with reduced timetable) and the service from Dunvegan and Glendale to Alexander Nicolson of Skeabost Bridge. Beaton's were out of the bus business after nearly thirty years. After the Macbrayne takeover the service was operated from their Ardvasar garage in the south of the island (from whence they operated their Ardvasar to Kyleakin daily service taken over from Macdonald and Maclean in 1948). Now Macbrayne would run through to Portree and back from Armadale Pier once a day from 1st September 1953. There was also introduced an additional summer only evening journey from Armadale on which one had to change from a Macbrayne bus to a Skye Transport bus in Broadford to continue the journey onwards to Portree. 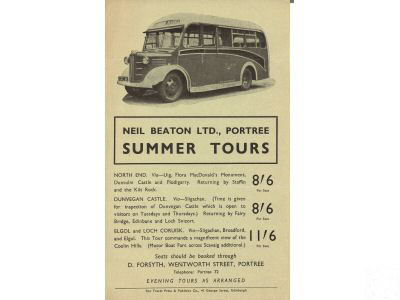 As a postscript it seems that Neil Beaton (Portree) Ltd returned to school bus operation and private hire in a modest way at a later stage with a small fleet of two or three vehicles in the 1960s and 1970s. As example in 1977 the firm were known to be operating 1954 Bedford SB / Duple LCJ929 (ex Yeomans, Canon Pyon, and previously new to Banstead Coaches, London) on school work.